This Clovis point was found in 1998 by a park ranger on a horse trail. This was an isolated find that was discovered on the top of a loess-mantled ridge along the East Side of the Missouri River floodplain, currently occupied by the Big Sioux River in Woodbury County, Iowa. It is clear from it’s context that Clovis hunters ranged along the tops of these hills, where there are great outlooks, seeking big game in the deeply cut valleys off the floodplain. This fluted point is very well made. It was fluted twice on one side and once on the other. These channel flakes are wide and cover almost half the length of the point. This Clovis point clearly lay exposed for a long time, as it is heavily patinated. One side was heavily encrusted with carbonates but this material was dissolved when blood residue analysis was done. 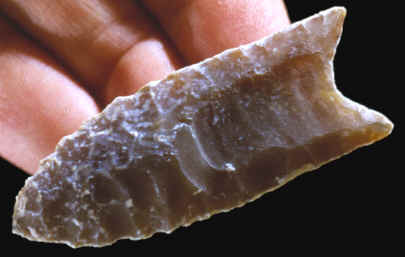 This Clovis point is made of Knife River flint and it measures 2 ¼ inches (5.7 cm) long.